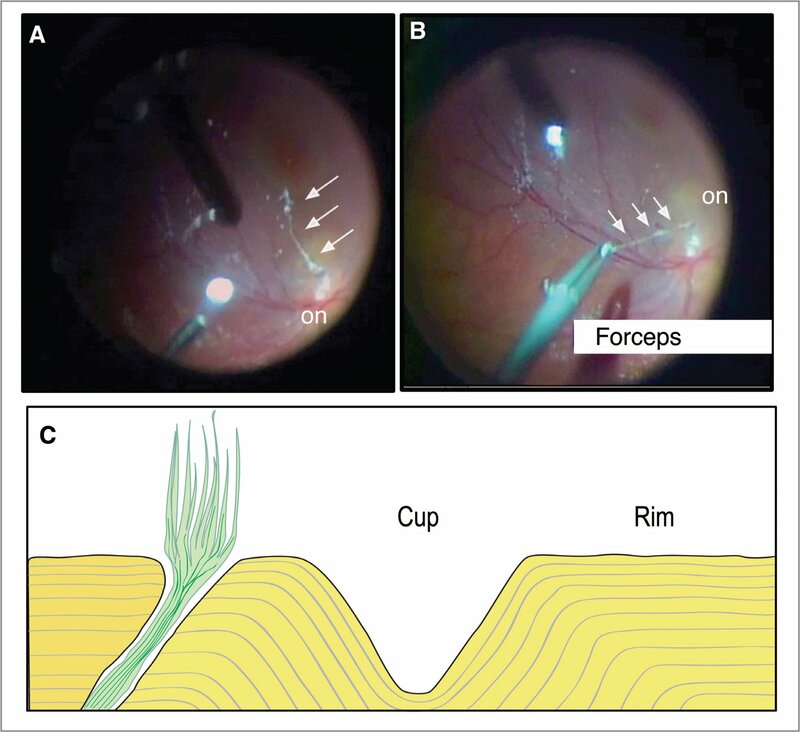 To describe a novel surgical technique using pars plana vitrectomy (PPV), internal limiting membrane (ILM) abrasion, and intravitreal fibrin glue for the treatment of optic disc pit maculopathy. Surgical case series technique with scanning electron microscopy (SEM) of human post-mortem eyes. 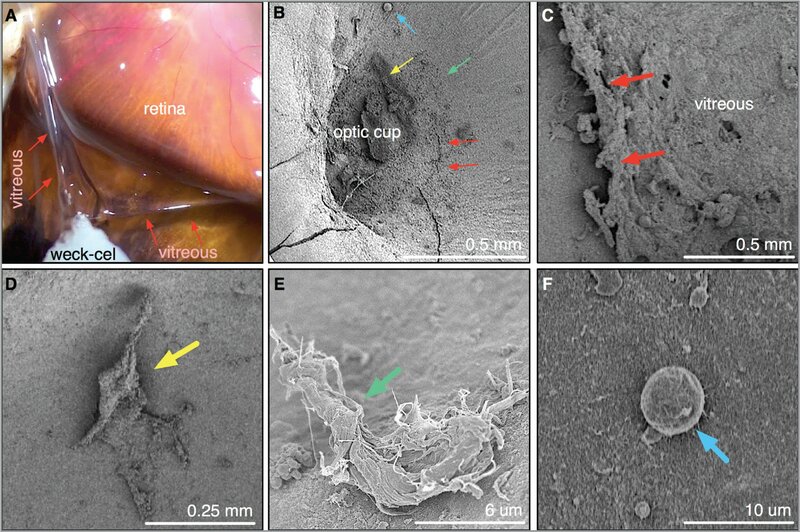 Using SEM, the authors demonstrate the persistent adherence of vitreous fragments to the optic disc following induction of posterior vitreous detachment in human postmortem eyes. The authors describe a surgical technique using PPV, Tano Diamond Dusted Membrane Scraper for an ILM abrasion, intravitreal fibrin glue (Tisseel), and gas-air exchange to seal optic disc pits. The authors report successful long-term visual and anatomical outcomes in three patients. Intravitreal fibrin glue, when combined with ILM abrasion, may be a viable treatment option for optic disc pit maculopathy with good short- and long-term visual acuity outcomes. SEM shows that ILM abrasion removes vitreous fragments, which are persistently adherent and may lead to failure with other interventional techniques. Several surgical techniques, including pars plana vitrectomy (PPV) with and without laser, gas tamponade, and/or internal limiting membrane (ILM) peeling, have been reported with variable success.1,4,8,9 Problems associated with surgical methods for closure include delayed re-attachment, long recovery times, and recurrent maculopathy.1,4 We describe the clinical and anatomical outcomes of a novel approach in treatment of ODP-M, employing intravitreal Tisseel glue (Baxter Healthcare, Deerfield, IL) in combination with PPV, ILM abrasion, and gas tamponade for serous macular detachments associated with optic disc pits (ODPs) (See Supplemental Video below). A standard three-port 23-gauge PPV (Constellation, Alcon, Texas) was performed using intravitreal triamcinolone acetonide (Alcon, Texas) to stain and highlight the vitreous. In all cases, a core vitrectomy was followed by posterior hyaloid separation using either the vitreous cutter or silicone-tipped cannula. The posterior vitreous detachment (PVD) was carefully extended around the optic nerve, across the macula, and into the midperiphery. Next, a Tano DDMS was brushed over the macula and to the optic nerve to remove surface membranes that stained with intravitreal triamcinolone. Tisseel fibrin sealant glue was prepared according the manufacturer's instructions. In all cases, following an air-fluid exchange, fibrin glue was dripped over the optic nerve. Then a gas-air exchange was performed with either 15% perfluoropropane (C3F8) or 20% sulfur hexafluoride (SF6). No peripapillary laser was applied. Patients were instructed to assume prone position for 5 days. Previous reports have described the presence of a tractional membrane that spans the surface of the optic nerve pit. SEM studies on eyes with OPD-M found that defects in this tractional membrane can form, creating an access point for vitreous fluid to enter the subretinal space. Accumulation of subretinal fluid leads to schisis-like separation of the macular nerve fiber layer.12 Thus, intact membranes may serve a protective role against serous macular detachments. Closure of this communication between the vitreous cavity and subretinal space is critical to preventing the progression of ODP-M. We used SEM to study the removal of vitreous fragments in postmortem eyes. A PVD was created using a Weck-cel (Beaver-Visitec International, Waltham, MA) in human autopsy eyes collected within 4 hours of death (Figure 1A). Despite removal of the posterior hyaloid, SEM imaging showed the presence of surface membranes, vitreous fragments, and cellular remnants in the peripapillary region (Figures 1B–1F). Residual fragments appeared as strands on SEM (Figures 1D and 1E). This was similar to our previous findings in eyes with macular hole, where creating a PVD was not sufficient to remove surface membranes with elastic properties.11 Since ILM abrasion with a Tano DDMS can remove these tractional elements, we designed a surgical procedure to ensure removal of tractional membranes or vitreous in the peripapillary area. Peripapillary surface membranes remain following posterior vitreous detachment in post-mortem eyes: (A) A Weck-cel sponge was used to elevate the vitreous from the retina and create a posterior vitreous detachment. (B) Low magnification scanning electron microscopy image of the optic nerve head specimen following posterior vitreous detachment. Residual cellular and collagenous elements remain (arrows). (C) Representative image of the vitreous edge of the detachment. (D) Magnification of a residual vitreous fragment present in the optic nerve head. (E) High-magnification image of a smaller vitreous strand in the peripapillary region. (F) Cellular remnant. We have previously shown that this maneuver will remove residual membranes from the retina surface and partially remove the ILM.11,12 Interestingly, in each case we observed a vitreous strand penetrating into the optic pit that was visible with triamcinolone staining (Figure 2). This optic pit vitreous strand was not visible in the preoperative exam or imaging. Forceps were used to remove the vitreous strand extending from the optic pit in all three cases presented below. Membranectomy of peripapillary surface membranes. (A, B) After abrasion using the Tano diamond-dusted membrane scraper, vitreous strands penetrating into the optic pit were visible with triamcinolone staining and removed with forceps. (C) Schematic of optic pit vitreous strands removed during surgery. Case 1: A 61-year-old woman with longstanding history of optic pit and macular schisis presented with best-corrected visual acuity (BCVA) 20/100. At 1 week postoperatively, OCT imaging confirmed a significant reduction in inner retinal schisis in the peripapillary region (Figure 3). Her BCVA improved to 20/40 at 1 week postoperatively and remained stable at 2-year follow-up. Case 1. (A) Fundus photograph of the left macula showed pigment spots and cystic cavities, along with atrophic and fibrotic changes. B. Preoperative optical coherence tomography showing subretinal and intraretinal cystoid cavities consistent with macular schisis. (C) At 1 week post-operatively, the intraretinal cystoid cavities were significantly smaller. (D) At 6 month postoperatively, the retina was anatomically flat with smaller inner retinal cystoid cavities. (E) At 1 year postoperatively, the retina was flat with anatomical closure of macular schisis. Case 2: A 14-year-old boy with optic pit and macular schisis, who had previously undergone several laser treatments without resolution of the schisis, presented with BCVA of 20/80. At 1 week postoperatively, there was complete resolution of intraretinal edema in the peripapillary inner retina (Figure 4). His BCVA remained 20/40 and was stable at 2 years follow-up. Case 2. (A) Fundus photograph of the left eye showed optic disc pit maculopathy (ODP-M) with pigmentary changes, foveal subretinal fluid, and atrophic changes. (B) Preoperative optical coherence tomography showed inner- and outer-retinal cystic cavities and subretinal fluid at the fovea. (C, D) There was a small macular hole (MH) with smaller outer retinal cystoid cavities at 1 week (C) and 1 month (D) postoperatively. (E) At 4 months postoperatively, the retinal was flat, with smaller outer retinal cystoid cavities and a small MH. (F) Following macular hole repair, the retina was flat with complete resolution of macular schisis and closure of the MH at 8 months from the time of their initial ODP surgery. Case 3. A 35-year-old woman with ODP, macular schisis, and serous retinal detachment of the right eye presented with a BCVA of 20/60. At 1 month postoperatively, the BCVA improved to 20/20 with near complete resorption of the Tisseel glue. Her BCVA remained 20/20 by 5 years postoperatively (Figure 5). Case 3. (A) Fundus photograph of the right eye showed a temporal optic disc pit with serous macular retinal detachment and an epiretinal membrane. (B) Preoperative optical coherence tomography shows a mild nasal epiretinal membraneand inner and outer schisis. (C) At postoperative week 1, macular schisis was reduced with significant anatomical flattening of the inner retinal schisis. (D–F) At postoperative months 1 through 3, macular schisis improved with gradual flattening of the outer retinal cystoid changes. (G) At 18 months postoperatively, there was asymptomatic mild macular edema with residual macular schisis. We describe successful treatment of ODP-M using a novel technique utilizing Tisseel glue with PPV, ILM abrasion, and gas tamponade. Direct sealing of the optic pit has previously been reported in small-sample studies using autologous platelets,13,14 an autologous scleral flap,15 or by eversion of the ILM into the pit as a seal.16 Other groups have also reported the use of Tisseel and Evicel (Ethicon, Somerville, NJ) tissue sealants with PPV and gas tamponade without ILM peel or removal of peripapillary vitreous in small series with stable outcomes.17,18 In our series, patients gained an average of five lines at 2 years postoperatively; suggesting that combining ILM peel or ILM abrasion with fibrin glue may carry a benefit toward better visual outcomes than PPV with glue alone. We demonstrate that in the presence of a PVD, peripapillary vitreous may remain attached to the optic nerve and extend into the optic pit, usually temporally toward the macula. This was readily apparent using chromovitrectomy using triamcinolone in all the presented cases. Persistent vitreous or glial tissue within the ODP cavity has previously been found in 89% of eyes intraoperatively and correlated with only 78% of eyes via OCT preoperatively.5 These findings further support the theories ascribing the origin of subretinal fluid in ODP-M to the vitreous adhesions.4 Here, using autopsy eyes, we have shown that ILM abrasion of the peripapillary area successfully removes these persistent vitreal adhesions to the optic pit, which may otherwise create traction on the optic pit. This technique, which was previously described in successful macular hole closure in a large retrospective study, limits the loss of subjacent tissue and the risk of dye toxicity.11,12 Future studies comparing the efficacy of ILM abrasion with vitreous removal alone or in adjunct with fibrin glue could further help elucidate the individual effect of either surgical factor to successful closure of ODP-M. The advantage of our surgical technique is the relatively rapid postoperative results both functionally and anatomically. In part, this rapid recovery reduces the risk of retinal pigment epithelium and retinal atrophy that may otherwise ensue following PPV without ILM peel and endolaser alone. This novel technique utilizing the ILM abrasion technique with the Tano DDMS, combined with the use of Tisseel glue, may be a viable alternative to closure of ODPs and aid in preserving adjacent retinal tissue. Gass JDM. Serous detachment of the macula. Secondary to congenital pit of the optic nervehead. Am J Ophthalmol. 1969;67(6):828–841. Skeie JM, Mahajan VB. Dissection of human vitreous body elements for proteomic analysis. J Vis Exp. 2011;23(47). pii: 2455. doi:10.3791/2455 [CrossRef]. Nadal J, Figueroa MS, Carreras E, Pujol P, Canut MI, Barraquer RI. Autologous platelet concentrate in surgery for macular detachment associated with congenital optic disc pit. Clin Ophthalmol. 2015;9:1965–1971. From VitreoRetinal Surgery PA, Minneapolis (DRPA); Retina Consultants of Southern California, Redlands, California (EKC); the Department of Ophthalmology, University of Ottawa, Ottawa, Ontario (PA); Omics Laboratory, Stanford University, Palo Alto, California (GV, LPE, VBM); and Byers Eye Institute, Department of Ophthalmology, Stanford University, Palo Alto, California (VBM). Dr. Mahajan is supported by Research to Prevent Blindness, New York, NY; The Doris Duke Charitable Foundation #2013103; and the National Institutes of Health (K08EY020530, R01EY026682, R01EY024665, R01EY025225, R01EY024698, R21AG050437, and P30EY026877) outside the submitted work. Mr. Velez and Ms. Evans are supported by NIH grant T32GM007337 outside the submitted work. Mr. Velez is also supported by NIH grant F30EYE027986 outside the submitted work. Dr. Almeida is a consultant for Alcon and the co-founder of Citrus Therapeutics outside the submitted work. Dr. Chin reports grants and research funds not related to the submitted work from Alcon, Allergan, Ophthotech, Ohr Pharmaceuticals, Regeneron, and Tyrogenex, as well as non-financial support from Citrus Therapeutics. Dr. Arjmand reports no relevant financial disclosures. Address correspondence to Vinit B. Mahajan, MD, PhD, Byers Eye Institute, Stanford Univeristy School of Medicine, 2452 Watson Court #2286, Palo Alto, CA 94303; email: mahajanlab@stanford.edu.